Garbage dumping is considered to be a social epidemic of post-modern times. In Uganda, one might find large deposits of litter around city centers. This is partly because there are minimal options for recycling, unlike the West where there can be a selection of options to recycle and reuse garbage. 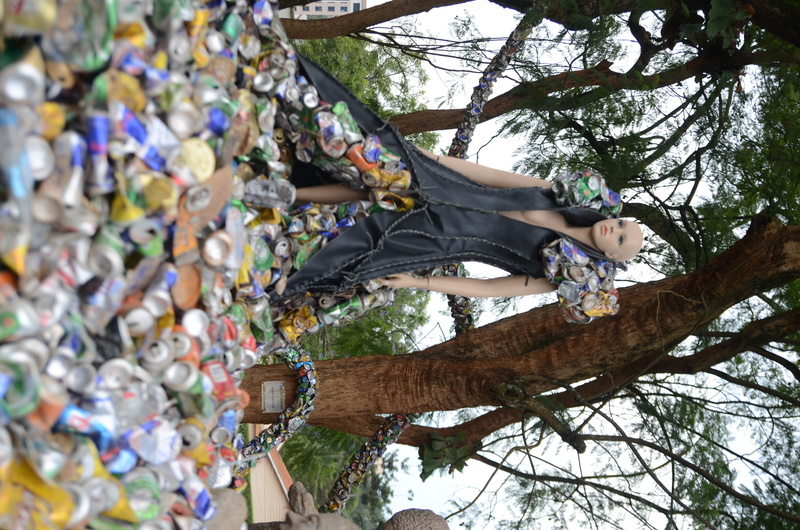 The Garbage Collectors project seeks to solve this problem by engaging five Ugandan eco-artists — Ronex, Xenson, Helen Nabukenya, Bruno Rungazu and Sandra Suubi — to communicate to the public about garbage recycling through functional objects and/or art. These artists are not the first to think about garbage as material for utilitarian sculpture and instillation art. Indeed, several of them have created similar pieces in the past. The element of interaction and participation was also visible in Bruno Ruganzu’s installation of the imposing Crazy Chicken draped in luminous colors. The Crazy Chicken was incomplete. Ruganzu had intended for there to be slides that would engage the audience in child-like play. In spite of this, according to the artist, hordes of guests spared no time to take ‘selfie’ pictures beside it. In this way, the chicken became a temporary monument that inspired another art genre: photography. This spontaneous engagement is ironic because the message the artist was trying to pass on to his audience was about the potential danger of over consumption of chicken. “Many young people especially on university campus consume chicken without really knowing the negative impact this has on their health. If you look carefully at the chicken, its wearing a sarcastic look in its eyes,” he says. Conversely, Suubi’s decorative and abstract installation conveys the message of self-belief and determination symbolized by two abstract plastic gigantic eggs. One egg has not yet hatched and the other hatched with the nestling envisioning the possibility of flying out and start a new life. This piece of work may well do as a back-drop to a performance stage, but not on city streets where it could easily be vandalized because of its abstractness. Both Xenson and Suubi express their thought processes without necessarily being instructive. 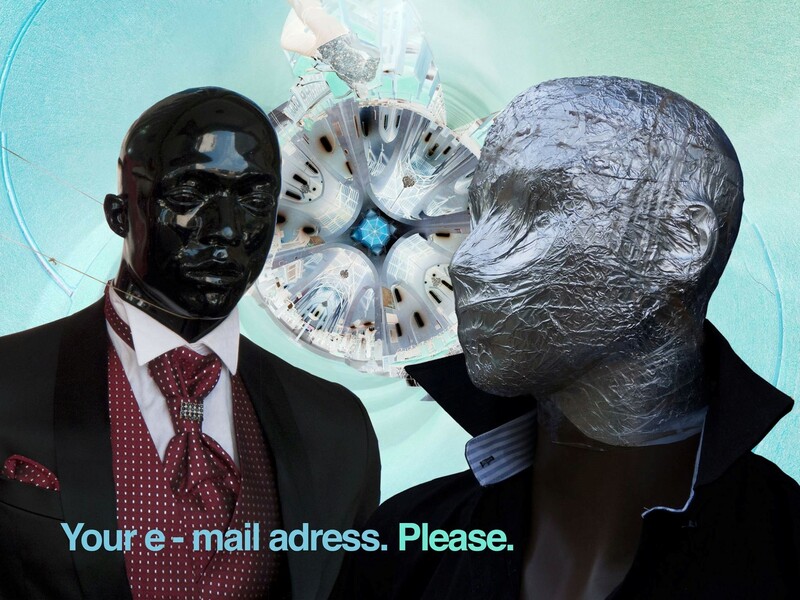 Their choice of media and technique invites attention from the public to engage and find meaning in the artists’ respective presentations. 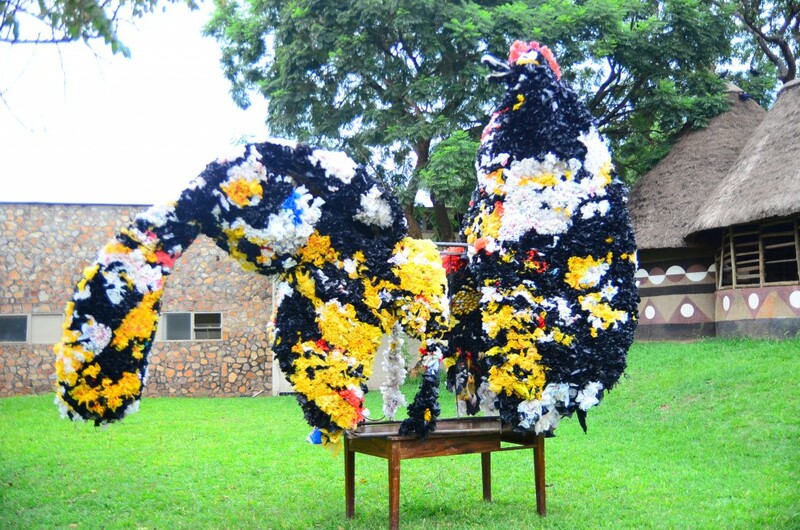 This collaboration between The Garbage Collectors project 2014 and Ugandan environmental artists is representative of socially conscious art. As such, it gives artists an opportunity to work with a variety of media and technique, at the same time extending their work to the public. In addition, the public is given a chance to use and interact with the creativity of artists and art. To realize the project objectives the work needs more artists and should extend beyond museum and educational spaces. This would encourage more involvement. For example, it would be interesting if the project involved the people in city slums of Kalerwe, Nateete, Katwe and Ndeeba where there’s magnified problem of waste management. With an abundance of refuse in the slums, what could these artists create? 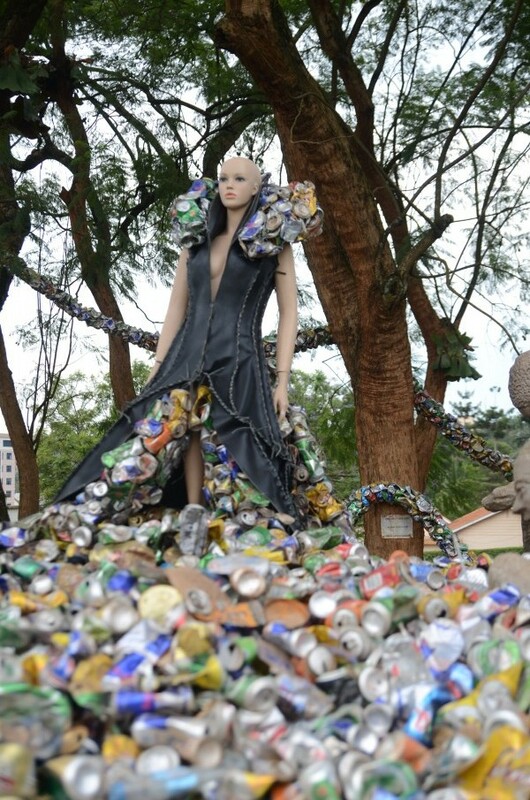 The Garbage Collectors’ Exhibition 2014 was made possible by Hivos and Afrika Arts Kollective.